Bt brinjal bharta – a saga of lau and whylence. | It's a Miracle! This entry was posted in because I said so, desi, Hindi, India, Indian cooking, Indian culture, scientifiky and almost science by Anirban. Bookmark the permalink. What if the insects, or at least some insects, love the Bangon Spray? They love begun anyway. Good point. 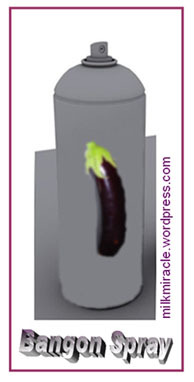 The bt brinjal is insect resistant because it has the bt-toxin. This is a type of insecticide, but there ARE insects that are resistant to it (as you allude). Of course, the Bangon (bt toxin) probably wouldn’t work because the toxin would likely get degraded in extraction. It wouldn’t be cost-effective either. Thanks for reading and for your support! Now we need to start an online petition. The Datta tomato is on google news today, its just that you spotted it early! Thanks for reading and for the update. Discover magazine also covered it. I guess I was at the cutting-edge by mentioning it before other news-organizations had a chance to pick up on it. That’s hilarious. I am ROFL. 🙂 Take care and thanks for reading.